Snoopy Loopy will not be resting on his laurels, despite handing connections a surprise payday when taking the £225,000 Betfair Chase under Seamus Durack. 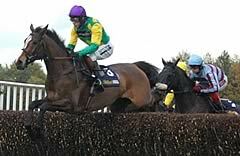 Kauto Star - a bad blunder at the third-last fence cost him momentum. All of the pre-race talk surrounded Kauto Star, as he attempted to land the prize for the third year running, but a bad blunder at the third-last fence cost him momentum and he was arguably beaten when crashing out at the last. The 33-1 winner had looked a most unlikely winner and at one stage hit 209-1 in Betfair’s in-running market, but as leader Tamarinbleu tired on the run from the final fence, Durack conjured a remarkable rally out of his mount who gathered in his rivals for a half-length victory. Bowen and owner Dai Walters are targeting the £200,000 first prize for the Order of Merit with today’s winner, who took his lead at the top of the standings to 10 points, with Ascot scorer Chomba Womba in second place. Next stop in that quest could be the Hennessy Cognac Gold Cup at Newbury in a week’s time, where he would have to carry a 6lb penalty. “We’ll have to think about it, as he will be in off his old rating and he’s in such good form now,” said Bowen. “I am absolutely delighted with that. He has kept improving race by race and I didn’t think he would be disgraced today. “He ran a similar sort of race at Aintree but the two and a half miles was a bit too sharp for him and then at Wetherby the race might have come a bit quickly - if he’d run like that at Wetherby, he’d have won shouldn’t he? Bowen paid 120,000 guineas for the winner at the Doncaster Sales back in May 2005, but things did not go to plan at first. Durack, whose career has been blighted by a series of serious injuries, was delighted to be in the winner’s enclosure with a horse with whom he has struck up a fine relationship. “I knew that he was very tough and that he had some improvement still in him,” said the rider. “When he ran in the Old Roan he’d had five weeks off and wasn’t quite 100 per cent and Wetherby was only six days later. Trainer David Pipe was more than satisfied with the effort of Tamarinbleu, the half-length runner-up in today’s highlight, the £225,000 Grade One Betfair Chase. Pipe said of the 25/1 chance, who made most of the running: “That was probably another career-best effort from Tamarinbleu. “His only blip last year was at Cheltenham, but he went on to run well at Aintree. “We thought Ollie Magern was going to make the pace but when we learnt that he wasn’t going to, I told Tom (O’Brien, jockey) to go his own pace and he has led them a merry dance. “You can’t be too disappointed. Look at the prize money for second! A further two and a quarter lengths back in third was Exotic Dancer, runner-up 12 months ago, and Barry Simpson, racing manager to owner Sir Robert Ogden, felt a lack of pace had not helped the eight-year-old. He said of the 7/2 second favourite: “I am a little bit disappointed. “He did not travel well and raced with his head in the air. “It just didn’t slot into place today. A P (McCoy) thought he still win two out but it was not to be. The 2/5 favourite Kauto Star, the Betfair Chase winner for the past two years, unseated his rider Sam Thomas at the last, after making a bad mistake three fences from home. Trainer Paul Nicholls said: “I was never happy with him in the race today and he was never really travelling. “I would have been happier if he had had more space on the outside rather than tanking along on the inside. I haven’t had a chance to talk to Sam yet but things did not work out. “He jumped into the wing at the third last when Sam asked him for a big one. He might still have won. I don’t know. “He was always going to get beat one day. That’s racing. We have had our ups and downs with him before, and he can’t be at his very best every single day. Sam Thomas was understandably despondent after 2/5 favourite Kauto Star unseated the rider at the last fence in the feature Betfair Chase. Thomas said: “I thought the horse was just getting on terms and he would have scrapped on well after the last. “When he made a mistake at the third last, Tom’s horse (Tamarinbleu) just started to go to his right, so I went down the inside. I don’t know if that made a difference. It probably didn’t help. “I think he probably would have won. I am just absolutely gutted, there is not really much I can say. Winning Jockey: Seamus Durack Born: November 3, 1975 Background: The son of a GP, Seamus was born on Australia, but grew up in Clogheen, Tipperary. He was drawn towards riding as a career after schooling for trainer Finbarr Fennessy while studying equine science at university at Limerick. Quit his studies after a year, rode three point-to-point winners and arrived in Britain in 1996, but only rode one winner for Philip Hobbs in his first season. Moved on to Dai Williams’ yard and won the Amateur Jockeys’ title in 19978/98 with 41 victories to his name. He has had to overcome plenty of spells off due to injury but endured to gain his biggest success in the 2008 Betfair Chase on Snoopy Loopy. Cheltenham Festival Wins: (1) Walwyn Muir (1998 in Truth) Big Race Wins: Betfair Chase (2008 Snoopy Loopy), Unicoin Handicap Chase (1999 Eirespray), Rossington Main Novice Hurdle (1999 Tonoco), Red Square Vodka Champion Hurdle Trial (2004 Flame Creek), Britannia Building Society English Summer National (Take The Stand 2004) Number of Wins (1997/98-2007/08): 41; 52; 56; 21; 20; 46; 39; 54; 2; 14; 31; Wins This Season: 22. Following its successful inauguration in 2005, the weekend of Saturday and Sunday, November 22 and 23, 2008, sees the fourth running of the Northwest Racing Masters. An exciting addition to the jumping calendar, the Northwest Racing Masters involves top-class racing at both Haydock Park and Aintree. The weekend has quickly established itself as a popular event with the racing fraternity and the public. Haydock Park hosts the £225,000 Grade One Betfair Chase on the first day of the Northwest Racing Masters, which was won in great style by Kauto Star for the second year running in 2007. He brushed aside a high class field in 2006 to come home 17 lengths clear of Irish raider Beef Or Salmon. Kauto Star remained unbeaten all season and captured the Betfair Million bonus for also winning the Stan James King George VI Chase at Kempton on Boxing Day and the totesport Gold Cup at Cheltenham in March. Exotic Dancer, who finished two and a half lengths behind Kauto Star in the Gold Cup, reduced that margin to half a length in the 2007 Betfair Chase but was always being held, with Beef Or Salmon another 18 lengths back in third and horses of the class of Turpin Green and My Way De Solzen further in arrears.